Nadas won the die roll and chose to play first. He started with Allure of Darkness and banished Thunder Dragonroar, which Special Summoned Thunder Dragondark. He Set one back row card and activated Danger!? Tsuchinoko?, discarding Thunder Dragonmatrix. He Special Summoned Tsuchinoko and drew a card. He activated another Tsuchinoko, this time discarding Tsuchinoko itself and Special Summoning it. He used Dragondark and a Tsuchinoko to play Reprodocus, and Dragondark added Thunder Dragon to his hand. He used that to get two more copies of Thunder Dragon. Reprodocus turned Tsuchinoko into a Dinosaur, then he flipped The Melody of Awakening Dragon! He discarded Thunder Dragon to get two copies of Chaos Dragon Levianeer! He Special Summoned a Levianeer, banishing three LIGHT monsters, and Special Summoned Dragondark with Levianeer. He then used all his monsters to play Saryuja Skull Dread! He drew four cards and put three cards on the bottom of his Deck. He used Thunder Dragonhawk to Special Summon his banished Dragonmatrix, then Normal Summoned Phantom Skyblaster! It created three Skyblaster Tokens, filling his field. 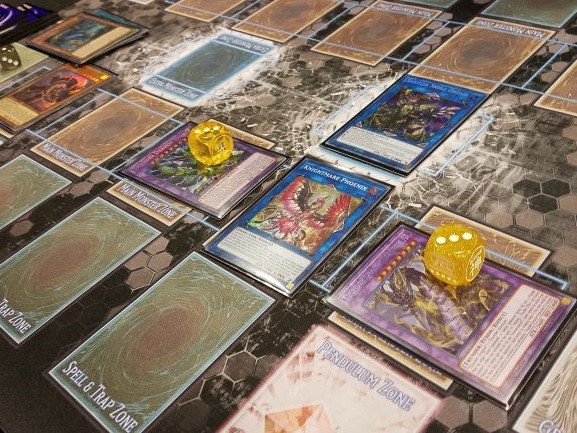 He played Link Spider using a Token, then used Spider and another Token to play Knightmare Phoenix. Phoenix and the last Token were used to play Knightmare Unicorn. 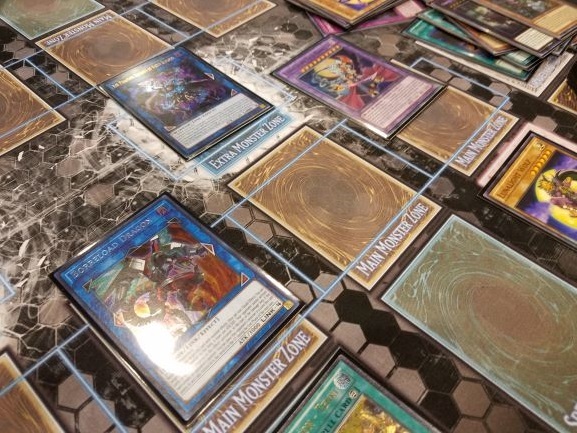 He then used Dragonmatrix to play Linkuriboh, and Dragonmatrix added another Dragonmatrix to his hand. He Special Summoned his second Levianeer, banishing two Tsuchinoko and the other Levianeer from his Graveyard. Linkuriboh, Levianeer, and Skyblaster were used to play Curious, the Lightsworn Dominion, which sent Eradicator Epidemic Virus to the Graveyard, then it sent Phantom Skyblaster, Dragondark, and Dragonhawk from the top of the Deck. Nadas Special Summoned White Dragon Wyverburster, using it and Curious to play Knightmare Gryphon. It discarded Thunder Dragon to Set Eradicator Epidemic Virus on the field. Saryuja Special Summoned Dragonmatrix, and he Tributed it for Thunder Dragon Colossus. Colossus, Unicorn, and Gryphon were all were boosted by Saryuja. Neven opened with Fire Formation – Tenki, Danger! Mothman!, Lunalight Kaleido Chick, and two Lunalight Tiger. He drew Lunalight Yellow Marten, and Nadas chose not to flip Eradicator Epidemic Virus yet. Neven Normal Summoned Kaleido Chick, which sent Lunalight Purple Butterfly to the Graveyard. He banished Butterfly from the Graveyard to Special Summon Yellow Marten from his hand. He Xyz Summoned Brotherhood of the Fire Fist – Tiger King, linked to Nadas’s Saryuja. That meant Tiger King was safe from Gryphon, so he detached Chick from Tiger King to negate Nadas’s monsters this turn! Neven played Fire Formation – Tenki, adding Lunalight Black Sheep to his hand. He played Lunalight Tiger in his Pendulum Zone, and Nadas now flipped Eradicator Epidemic Virus, Tributing Thunder Dragon Colossus and declaring Spell Cards, to destroy Lunalight Tiger and Tenki. When Tiger was destroyed it Special Summoned Kaleido Chick, which sent Lunalight Panther Dancer to the Graveyard. He used Tiger King and Chick to play Fire Fighting Daruma Doll, then played his second Tiger in the Pendulum Zone. He used it to Special Summon Kaleido Chick which sent Lunalight Wolf to the Graveyard. He bounced Tiger to Special Summon Yellow Marten from the Graveyard. He used Daruma Doll and Marten to play Summon Sorceress, which Special Summoned another Kaleido Chick. Chick’s effect sent another Marten to the Graveyard. He used the two Chicks to play Outer Entity Nyarla, which detached the Lunalights to instead attach Daruma Doll as an Xyz Material. Then, he used Nyarla to play Outer Entity Azathot. He used Black Sheep’s effect to get Lunalight Wolf in his hand and activated it in his Pendulum Zone. He used its effect to Fusion Summon Lunalight Leo Dancer! Leo Dancer attacked Unicorn and used its effect to destroy all Nadas’s monsters! Leo Dancer attacked again, and Azathot ended the first Duel on Neven’s first turn! Neven powered through Eradicator Epidemic Virus, Thunder Dragon Colossus, Knightmare Gryphon for a spectacular finish with Lunalights! Nadas chose to play first. The Duelists shook hands and begun. Nadas played Batteryman Solar, sending Thunder Dragonroar to the Graveyard. He banished Dragonroar to play Wyverburster, and Dragonroar Special Summoned Dragondark. Solar created a Batteryman Token. He played The Melody of Awakening Dragon, discarding Nessie to get two copies of Chaos Dragon Levianeer, and Nessie also searched for Danger!? Jackalope?. He activated Jackalope and discarded a Levianeer. He Special Summoned Jackalope and drew a card. He used all his monsters but Jackalope to play Saryuja Skull Dread. The Chain of effects resolved with Wyverburster searching for Black Dragon Collapserpent, then Saryuja Skull Dread drawing four cards and returning three, then Dragondark searching for Thunder Dragon Fusion. He Special Summoned Collapserpent, then used Thunder Dragon to get two more copies of itself. He Set a card in his back row. Then, he banished three DARK monsters to play Levianeer, which shuffled Lunalight Kaleido Chick from Neven’s hand into the Deck. Nadas used Thunder Dragonhawk to Special Summon his banished Dragonroar. He used Tsuchinoko from his hand, discarding itself and Summoning it. He used Collapserpent, Tsuchinoko, and Jackalope to play Curious, the Lightsworn Dominion. Collapserpent searched for Wyverburster, then Curious, the Lightsworn Dominion sent Summon Limit to the Graveyard. 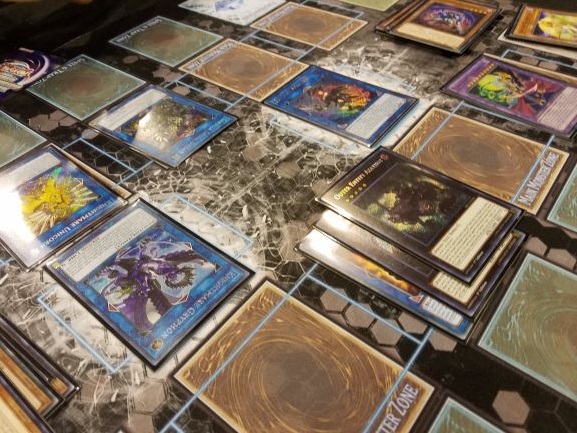 Curious then sent Allure of Darkness, Melody, and Dragonmatrix from the top of the Deck. He used Curious and Levianeer to play Knightmare Gryphon, discarding Thunder Dragon to Set Summon Limit on the field and draw a card. He Tributed Dragonroar to play Thunder Dragon Colossus. He activated Nessie in his hand, discarding Nessie. He flipped Thunder Dragon Fusion, putting Dragonmatrix and two Thunder Dragon in the Deck to play Thunder Dragon Titan. Saryuja Special Summoned Thunder Dragon from the hand. He had planned to play Wyverburster alongside it but couldn’t play a second one in the same turn. He passed with Colossus, Titan, and Gryphon all boosted by Saryuja. Neven had two Dinowrestler Pankratops, Lunalight Wolf, and Luna Light Perfume. He drew Book of Eclipse. He Special Summoned Pankratops, with a 300 power-up from Saryuja. It attacked and destroyed Knightmare Gryphon. He Set Book of Eclipse and Perfume. Nadas banished Thunder Dragon Fusion to search for Dragonhawk. He used it to Special Summon his banished Dragondark, and Neven responded with Pankratops to destroy the Set Summon Limit. Nadas Special Summoned Wyverburster, banishing Nessie. 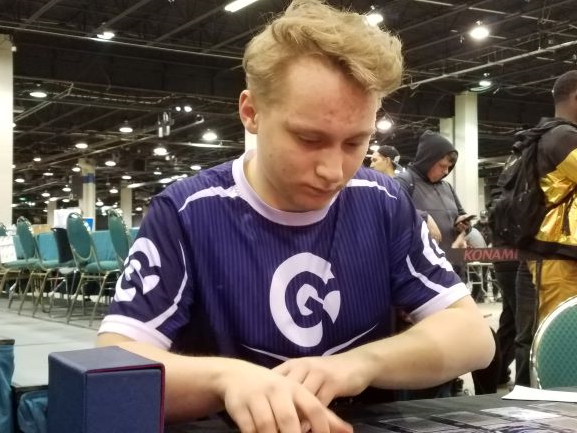 He combined Wyverburster with Thunder Dragon to play Knightmare Phoenix, which discarded Gold Sarcophagus and targeted the Set Book of Eclipse. Neven thought a moment and conceded. Even if he Chained Book of Eclipse, Nadas could just flip up the monsters right after and finish him off. Neven opted to play first in the final Duel. The entire tournament comes down to this moment! The Duelists shook hands. Neven’s final opening hand was Book of Eclipse, two Tenki, Tsuchinoko, and Foolish Burial. Foolish Burial sent Yellow Marten to the Graveyard. With Yellow Marten’s effect he added Lunalight Serenade Dance to his hand. He activated Tsuchinoko, discarding the Serenade Dance! He Special Summoned the Tsuchinoko and drew Luna Light Perfume. He activated Tenki to add Lunalight Tiger to his hand. Then, he banished Serenade Dance and pitched his spare Tenki to Special Summon Kaleido Chick. The Chick sent Lunalight Panther Dancer to the Graveyard, then Neven played Tiger and had it revive Yellow Marten. He used Marten and Tsuchinoko to play Underclock Taker. He bounced Tiger to Special Summon Yellow Marten, and used Underclock Taker and Kaleido Chick to play The Phantom Knights of Rusty Bardiche. It sent The Phantom Knights of Silent Boots to the Graveyard to Set The Phantom Knights’ Rank-Up-Magic Launch. Then Neven banished Silent Boots to get The Phantom Knights of Shade Brigandine. He played Lunalight Tiger and revived Kaleido Chick. It sent Purple Butterfly to the Graveyard. He used Chick and Marten to Xyz Summon Time Thief Redoer, and used its effect to banish itself, getting its Xyz Materials in the Graveyard. He Set Book of Eclipse and Shade Brigandine. In the End Phase, Time Thief Redoer returned to the field. Nadas activated Jackalope, and Neven responded with The Phantom Knights’ Rank-Up-Magic Launch! He turned his Time Thief Redoer into Outer Entity Azathot. Jackalope resolved, discarding Allure of Darkness; Jackalope hit the field and Nadas drew a card. In a new Chain, Rusty Bardiche activated and destroyed Jackalope! Nadas Set a monster, unable to make a play due to Azathot. He had The Winged Dragon of Ra – Sphere Mode, but Neven had specifically only played two monsters to avoid that potential problem. Neven drew a Jackalope of his own. He flipped Shade Brigandine, then played Luna Light Perfume to bring Kaleido Chick back. He used Perfume in the Graveyard and discarded Jackalope to add Lunalight Wolf to his hand, and Jackalope Special Summoned Danger! Bigfoot!. He played Wolf in his Pendulum Zone, then bounced Tiger to bring Yellow Marten to the field. He used Marten, Chick, Azathot, and Bigfoot to play Borreload Dragon! Then, he used Wolf to Fusion Summon Lunalight Leo Dancer! Leo Dancer attacked the Set monster, then attacked directly. Borreload and Rusty Bardiche attacked and took the Duel and the Match! 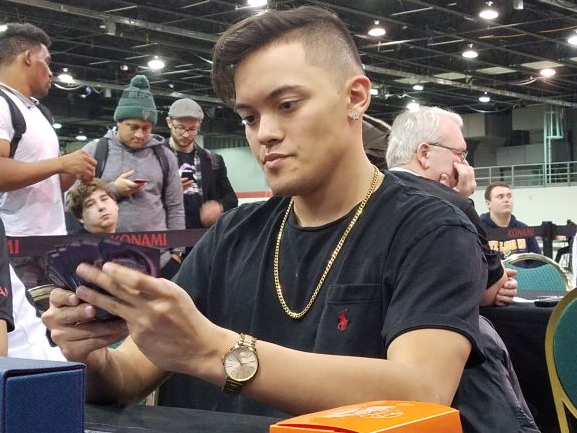 Congratulations to our newest YCS Champion, Raphael Neven!